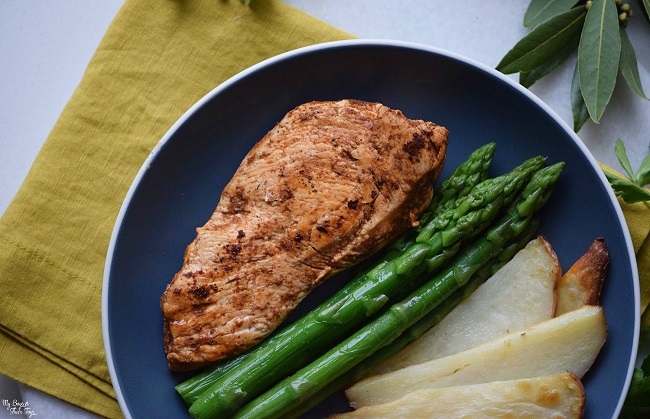 Chicken is one of our favorite proteins to eat. It’s also one of the healthiest! 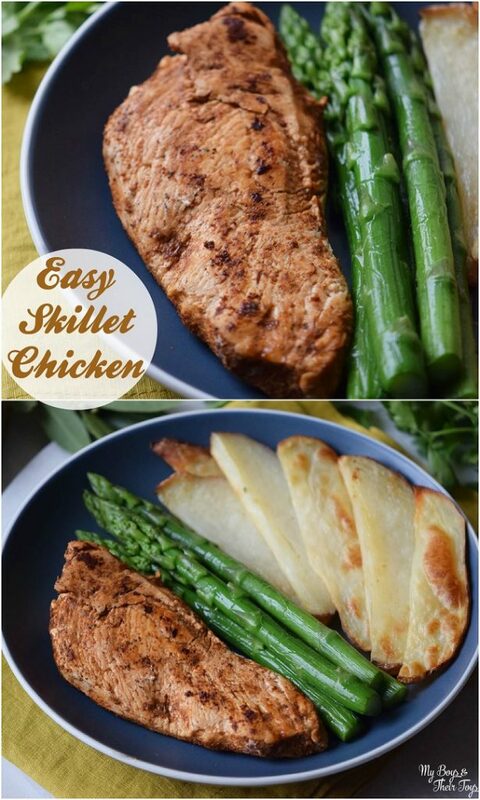 If you’re in the mood for skillet chicken, and looking for an easy dinner recipe – this is it! Read on to grab the delicious recipe below. Place the chicken in a resealable plastic bag, add the white wine, garlic, salt, pepper, and ginger. Take to the fridge and let marinate overnight. When ready to cook, heat oil in a skillet. Cook the chicken for 5 – 10 minutes per side. 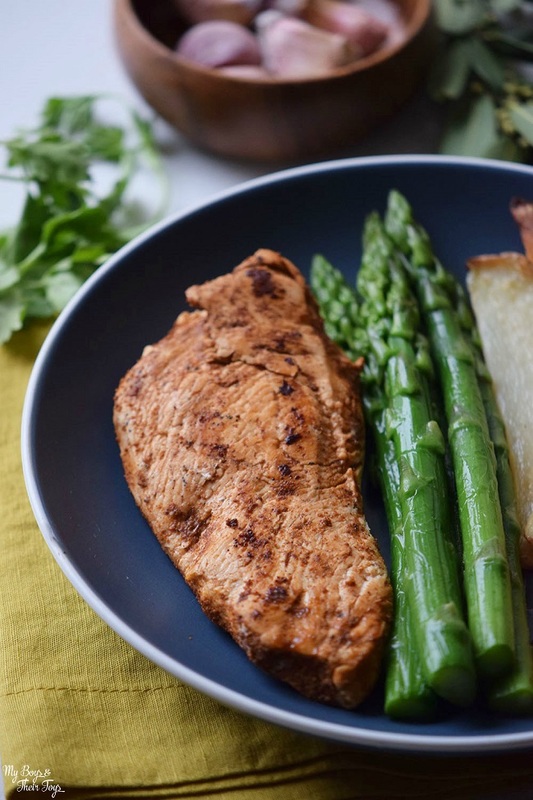 Asparagus and sliced potatoes make a perfect side for this easy chicken skillet dish. Here’s how to cook them: pan fry the veggies together with a bit of olive oil and butter over medium heat for approximately 10 minutes. Voila! Dinner is served….and in less than 30 minutes! Who doesn’t love a quick and easy dinner recipe? I’ve shared plenty of other chicken dishes on the site. Here’s a few favorites: Shredded Chicken Nachos (made in a slow cooker), Baked Chicken Parmesan, and a family favorite – Chicken Alfredo. You can check out all of our other dinner recipes here. Enjoy! What is your favorite chicken recipe? Share it with us below! This looks great, I love asparagus! I like the use of powdered ginger, and white wine always adds a great flavor. The chicken looks delicious and tender! I bet it’s so flavorful too! The asparagus makes my mouth water. Nice one pan dish with balanced food. Love chicken and asparagus and taters. The marinade for this chicken sounds delicious. I’ll have to try it out. I’m gonna make this for my family! It sounds so easy! At the present time, Chicken is that of what I can afford in the form of meats and I’m always looking for new way’s to prepare it! Thanks! This meal looks delicious! I will have to make this for the family. I love easy Chicken skillet recipes and this one is so easy and I will have to make it. Thanks for sharing. I would love to make this for my hubby, it looks amazing! I always have a hard time with chicken and would love to try this recipe!